Soundplant is a digital audio performance program that turns your computer keyboard (yes, your QWERTY keyboard) into a versatile, low latency sample-trigger and playable instrument. It can assign sound files of unlimited size and any format onto 72 keyboard keys, giving you hours of instantly-playing audio at your fingertips with no extra hardware needed. Use it as a performance, presentation, or sound design tool, as a drum pad, to mix together tracks in realtime, to create music or loops, or to trigger sound effects or background tracks during a show. Because it is a standalone software sampler that uses your own sounds, Soundplant is an infinitely flexible electronic instrument limited only by the variety of sounds that you feed it. A simple graphic interface provides for drag-and-drop configuration of each key and several options which control the way each sound is triggered, with several non-destructive realtime effects. Playing sounds are displayed with a progress bar and track time, and you can turn on ‘background key input’ to trigger sounds while using any other software with Soundplant hidden. Launch an unlimited number of Soundplant instances to expand polyphony and output to multiple audio devices simultaneously. 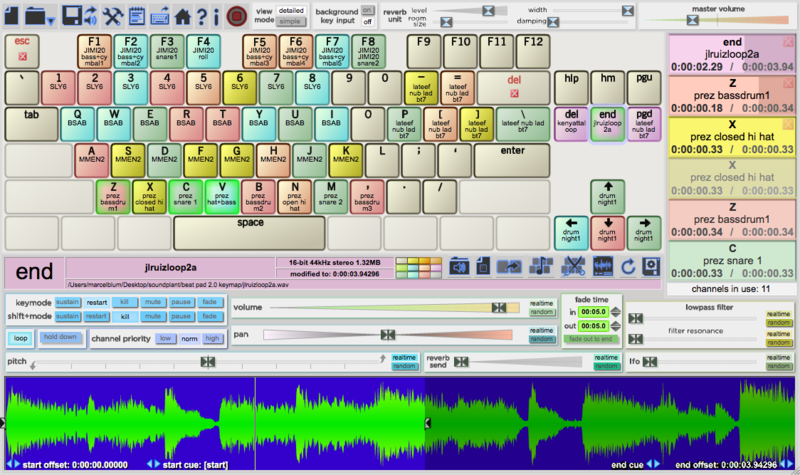 Soundplant, now in its 16th year and winner of multiple awards, was designed to do one thing and do it well: to trigger sound files from the computer keyboard with maximum speed, efficiency, and ease of use. Users love its rock-solid stability for live events, its simple 1 sound per 1 key metaphor which eliminates the complications of other software samplers, and its ultra-optimized use of the computer keyboard with lowest-possible latency requiring no external devices or MIDI. Soundplant users include DJs, musicians, sound engineers, educators, broadcasters, and more, like bands Man or Astro-Man? and Nile, the BBC, the NFL’s Tennessee Titans, National Public Radio, and Disney.